Inspired by the way dolphins hunt using bubble nets, scientists at the University of Southampton, in collaboration with University College London and Cobham Technical Services, have developed a new kind of radar that can detect hidden surveillance equipment and explosives. The twin inverted pulse radar (TWIPR) is able to distinguish true ‘targets’, such as certain types of electronic circuits that may be used in explosive or espionage devices, from ‘clutter’ (other metallic items like pipes, drinks cans, nails for example) that may be mistaken for a genuine target by traditional radar and metal detectors. The new system has been developed by a team led by Professor Tim Leighton from the University’s Institute of Sound and Vibration Research and is based on his unique sonar concept called twin inverted pulse sonar (TWIPS). TWIPS exploits the natural abilities of dolphins to process their sonar signals to distinguish between targets and clutter in bubbly water. Some dolphins have been observed to blow ‘bubble nets’ around schools of fish, which force the fish to cluster together, and their sonar would not work if they could not distinguish the fish from the bubbles. The technique uses a signal consisting of two pulses in quick succession, one identical to the other, but phase inverted. Professor Leighton, along with Professor Paul White and students Dan Finfer and Gim Hwa Chua, showed that TWIPS could enhance linear scatter from the target, while simultaneously suppressing nonlinear scattering from oceanic bubbles. Professor Leighton’s team proposed that the TWIPS method could be applied to electromagnetic waves and that the same technique would work with radar. They teamed up with Professor Hugh Griffiths and Dr Kenneth Tong of University College London and Dr David Daniels of Cobham Technical Services to test the proposal, by applying TWIPR radar pulses to a ‘target’ (a dipole antenna with a diode across its feedpoint - typical of circuitry in devices associated with covert communications, espionage or explosives) to distinguish it from ‘clutter’ (represented by an aluminium plate and a rusty bench clamp). In the test, the tiny target showed up 100,000 times more powerfully than the clutter signal from an aluminium plate measuring 34 cm by 40 cm. The study, ‘Radar clutter suppression and target discrimination using twin inverted pulses’ is published in the journal Proceedings of the Royal Society A. Professor Leighton says: “As with TWIPS, the TWIPR method distinguishes linear scatterers from nonlinear ones. However, in scenarios for which TWIPS was designed, the clutter scatters nonlinearly and the target linearly - while in situations using TWIPR, these properties are reversed. 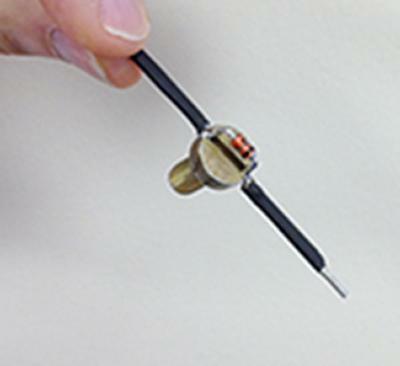 Given that the diode target measured 6 cm in length, weighed 2.8 g, costs less than one Euro and requires no batteries, it allows the manufacture of small, lightweight and inexpensive location and identification tags for animals, infrastructure (pipelines, conduits for example) and for humans entering hazardous areas, particularly where they might be underground or buried. These tags can easily be tuned to scatter-specific resonances to provide a unique identifier to a TWIPR pulse, what Professor Leighton calls ‘the TWIPR fingerprint’. Buried catastrophe victims not carrying such tags might still be located by TWIPR, as it can carry the bandwidth to search for mobile phone resonances, offering the possibility of locating victims from their mobile phones, even when the phones are turned off or the batteries have no charge remaining.